Adding a sitemap or content tree to your site should not have to a challenge. If you do it manually, you are going to have to spend a lot of time accomplishing this task though. SiteTree for WordPress is a handy plugin that saves you time adding a Google Sitemap to your website. You can also add a customizable archive page to your site with this. SiteTree is easy to customize. You can create Google and HTML5 sitemaps for your site with this. Priority and update frequency for your information can be modified. The script tells you the number of URLs in your site-tree and its rebuilt time. It also shows you when Google has been pinged to reach your new content. 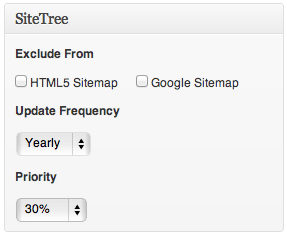 SiteTree is fast and easy to customize. It saves you time creating a sitemap for your website.